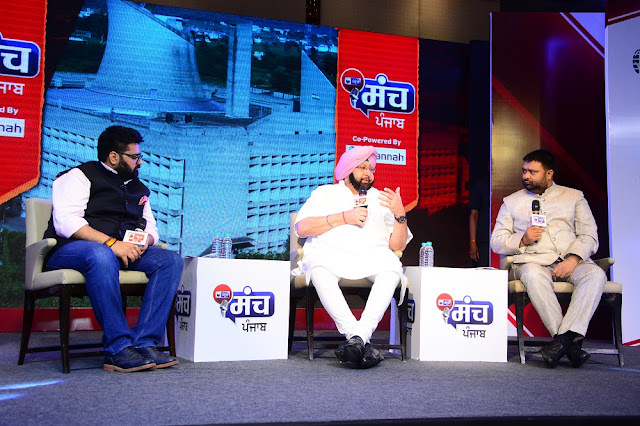 India News, known for its direct and unbiased brand of journalism, hosted Manch Punjab, an exclusive conclave, held in Chandigarh to present a comprehensive overview of the state government under the leadership of Chief Minister Capt. Amarinder Singh. Chief Minister Capt. Amarinder Singh was the chief guest at the elaborate event attended by political leaders, bureaucrats, economists, leading journalists, corporates and esteemed members of the civil society. An insightful discussion with the chief minister revealed the government’s emphasis on bringing in investment into the state, improving the state of agriculture and reinforcing the status of Punjabis across the world. The event, spread over a day, featured high-profile leaders, top government officials and members from the opposition. Besides political leaders, the event was attended by bureaucrats, economists, leading journalists, corporates and esteemed members of the civil society. India News Manch is an India News initiative to foster a sense of citizenship and make political processes more transparent and accountable towards the people of the country. The event in Punjab was marked by multiple panel discussions and one-on-ones that sought to address several key issues including Law and Order, Development and Infrastructure, Health and Education, Youth Welfare and Employment, Women Safety and Agriculture. Integrated into the format of the event was the Punjab Gaurav Awards, which brought the spotlight on high-caliber individuals from the state, known for creating extraordinary success stories and inspiring the state, and the nation at large, through their exemplary work. The winners were carefully screened and selected by an esteemed panel, comprising members of the editorial board at iTV Network, based on their individual proficiency and contribution to the respective areas of expertise. The event was co-powered by Savannah, a leading technology-based rice company. Rajdhani Besan was the food partner, and The Scholar World (Venture of Charms) and Chandigarh Group of Colleges, Jhanjeri were the associate sponsors of the event. 3. Winner - Mr. Rashpal Singh Dhaliwal. Category - Excellence in Campus Placement. (Chandigarh Group of Colleges). 15. Winner - Prof. M.S. Kang. Category - Excellence in Agriculture Science.